Directed by Charles Ferguson. Narrated by Matt Damon. When reviewing a documentary like this I think it’s fair to make a distinction between the subject matter of the documentary and the actual merits of the film-making itself. On the subject matter front, “Inside Job” surely deserves all the awards it is receiving (it recently won the Oscar for best documentary too). 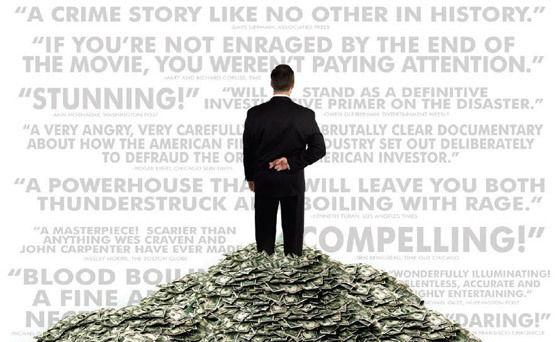 The film sets to explain the reasons (or arguably, some of the reasons) behind the financial crisis that’s hit the whole world. How did we end up where we are and whose to blame? It could be a fairly dry and dull subject , and a rather complicated one too, but Inside Job, for most of it, manages to keep it simple and gripping at the same time without dumbing it down too much. Inevitably it ends up focusing more one one side of the argument (the bankers) as opposed to following the more controversial route (going against the politicians. Though they do get mentioned, the film prefers not to be so hard on them as it is on those corporate people, obviously a much easier target). And since we are all on the same boat in this never-ending financial crisis and we are, forgive me the term, rather pissed off at the way the whole thing has been carried out and handled, we are perfectly happy to see it all laid out the way it is and eventually everyone will come out it feeling even more angry and frustrated than they were before. On that respect the film obviously really works. As a piece of film, “Inside Job” is less interesting. Its pace is very uneven: sometimes a bit too fast when it should be slow and a bit slow when you just want it to get on with it, for example there are way too many beginnings (one of them is probably there just because it plants the seeds for one of the best jokes of film later on about the instability of Iceland). Not everything hits home as it probably should and not everything is as clear as it should be. After a while one million begins to sound a lot like 10 millions or 100 millions or even a billion… it’s just a whole lot of money which we’ll never see anyway… It gets slightly repetitive. In most sequences the documentary unravels like a series lectures of economy: it is mainly voice over driven (read by Matt Damon who seems to be everywhere these days), visualized by unimaginative graphics and straight forward unremarkable archive footage. The real skill here seems to be more in the writing than the actual film-making. That’s by no means a criticism. This isn’t a film by Micheal Moore and, for most of its length, it doesn’t even try to be one: there are no stunts, and, on the surface, no tricks either. And yet, everyone who has seen this film will most likely remember the last third, which is probably the closest thing to something that Michael Moore would do, and to me, the most interesting part. It is the moment the film-makers turn against their contributors: economists, journalists and professors, who are just as guilty as everyone else. Watching them squirm in their seats having to defend themselves when they thought they were just there to give us a history lesson is the most pleasurable part of the film. And because we all want to point fingers and blame everyone for their greedy needs, we probably fail to notice the slightly biased use of the editing: I’m thinking of all those moments when questions are asked off-camera just so that we can catch the surprised faces of the people who are being interviews, and then the films cuts away to the next sequence, without giving them really the chance to answer. We really don’t mind though: we hate those people anyway and as long as they look stupid and guilty we are happy with it.